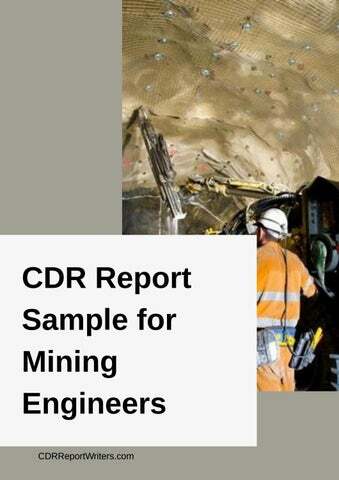 CDR Report Sample for Mining Engineers Curriculum Vitae (CV): Resume on the basis of a professional template. Continuing Professional Development (CPD): The sample of CPD clarifies the Engineering Knowledge of the applicant – 150 words. Mining Engineer Career Episode Sample 1: “Evaluation of Caterpillar’s Minestar Fleet Management System at Tropicana Gold Mine” – 2090 words Mining Engineer Career Episode Sample 2: “Surface Mining System” – 2505 words Mining Engineer Career Episode Sample 3: “Coal Mine Design and Feasibility” – 2290 words Mining Engineer Summary Statement Sample: Detailed explanation of all the competency element – 1895 words. Mining Engineer Career Episode Sample 1 Project Name: Evaluation of Caterpillar’s Minestar Fleet Management System at Tropicana Gold Mine In the first Career Episode, the author explains the project titled as “Evaluation of Caterpillar’s Minestar Fleet Management System at Tropicana Gold Mine” which he executed for the fulfillment of Bachelor’s degree in Mining Engineering and his responsibilities were: To perform a literature review on the present state of knowledge and develop a suitable project methodology. To break down the project into various categories and assign duration of time for the project. To assess Minestar fleet management system using CAT Minestar software to represent the model’s real life operation. To perform work regarding dispatch, management of fleet, assignment of truck and edits of cycle for the effectiveness of the project. To execute the work regarding delay management so as to meet the project’s objective. To perform a comparative analysis amongst CAT Minestar and Modular dispatch for further development in the mining field. Mining Engineer Career Episode Sample 2 Project Name: Surface Mining System In the second Career Episode, the author describes the project he completed as a final year Mining Engineering student on “Surface Mining System” and his responsibilities in this project were: To go through several papers related to surface mining and study the several books to obtain the knowledge of design and selection of equipment related to mining system. To analyze the several factors such as climate, geology and capacity of mining which affects the process of mining. To develop the working hours and roster through TALPAC Software. To design the mining system such as the design of sequence of mining, waste dump and haul roads. To perform the selection of equipment for the mining like truck and shovel and total estimation of project’s cost. To make a conclusion of numerous analysis performed in design and equipment utilized in mining. Mining Engineer Career Episode Sample 3 Project Name: Coal Mine Design and Feasibility In the third Career Episode, the author elaborates the engineering skills he used in the project entitled “Coal Mine Design and Feasibility” that he carried out as a part of his bachelor’s degree in Mining Engineering and his responsibilities were: To conduct the feasibility and selection of site for the model. To formulate the design and layout of the mining. To propose a method of underground mining. To make the suitable selection of underground equipment. To design the Conveyor System. To make the particular consideration for the design of Ventilation and control of dust.